INTELLECT IT > News > What really happens when Windows asks you to update! If you’re on Windows 10, chances are you’ve seen this message, or something similar, in a pop up on your computer. It can be worrying, so of course you click the provided button to update (patch) your computer. But are you really at risk? Not necessarily. This message in particular is very misleading, because it’s not a regular Windows update that Microsoft wants you to install – it’s the latest Windows 10 version, which is equivalent to reinstalling Windows 10 on your computer. It also takes (on average) an hour to install and reboot your computer. Microsoft releases updates several times a month, and a new Windows 10 version on a semi-annual basis. While it IS very important to make sure your computer is patched with these updates, installing them as soon as they are released can cause more harm than good. Microsoft has had a poor track record with updates this year – many of them have caused problems worse than those it was meant to solve. A good example is the latest Windows 10 version that was released – installing the upgrade caused a lot of users to lose files and applications. As a result of this issue Microsoft had to withdraw the new version. At Intellect IT we take the security and stability of your computers seriously – we carefully monitor updates as they are released, watching for issues that arise from installing the update, and approve those updates for your computers only when doing so will not cause harm to your computers. 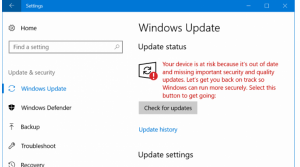 Through our remote monitoring and management system we can control all aspects of Windows updates on your computers – except for those pesky pop-ups from the update agent. As a fully managed customer of Intellect IT you can ignore those pop-ups, secure in the knowledge that we will keep your computers up-to-date safely.